VMware® is hands-down the virtualization choice of large and small organizations, and it is easy to see why. Not only is it a highly reliable and scalable platform, VMware also provides a complete set of tools you need to deploy, manage, monitor, and protect virtual machines. Paul Taylor: We’ve talked about the Townsend Security encryption and key management solutions for VMware. Today let’s put the focus on Microsoft SQL Server and encryption in the VMware customer environment. Can you give us an overview of how VMware customers can protect data in SQL Server databases? Patrick Townsend: Just to recap, we really need two things to get encryption right: A key management solution to protect the critical encryption keys, and an encryption solution for the SQL Server database. And they have to talk to each other. For the first part, our Alliance Key Manager for VMware solution provides a fully functional, enterprise key management solution that protects SQL Server databases as well as other databases and other operating systems. For encrypting SQL Server, our Alliance Key Manager solution comes with a full Microsoft SQL Server Extensible Key Management Provider. We call this Key Connection for SQL Server and it is one of the modules that our key management customers receive without paying additional license fees. Key Connection for SQL Server provides the encryption and integration with our key server to provide a complete, end-to-end solution for encrypting data in the SQL Server database. Paul Taylor: Can you talk a little about how Microsoft enables encryption in SQL Server? Patrick Townsend: If you are running SQL Server Enterprise Edition or higher, you have access to Microsoft’s automatic, full database encryption facility called Transparent Data Encryption, or TDE. You also have access to Microsoft’s automatic, column level encryption facility which Microsoft calls Cell Level Encryption. Both of these options, TDE and Cell Level Encryption, are implemented without any programming work at all. And both are fully supported by Alliance Key Manager and the Key Connection for SQL Server software from Townsend Security. Paul Taylor: What about Microsoft customers who aren’t using the Enterprise Edition of SQL Server? Can they encrypt their data with the Townsend Security solution? Patrick Townsend: With SQL Server Standard and Web Editions we provide two paths to encrypt data. The first is to use SQL Views and Triggers along with our .NET DLL to provide automatic encryption without any changes to applications. And the second path is to modify your C# or Java applications to use our .NET DLL to perform encryption at the application level. Both approaches leverage our Microsoft .NET DLLs to perform encryption with integrated key management. Both are very simple to implement. And there are no additional license fees to deploy and use our Microsoft .NET DLLs to accomplish this. Paul Taylor: So, walk me through the steps for encrypting data in my SQL Server Enterprise Edition database. How difficult is it? Patrick Townsend: Encrypting data in Enterprise SQL Server is really very easy. The first step is to install our Alliance Key Manager for VMware solution. It launches like any other virtual machine using the normal VMware applications and you can have a key management solution up and running very quickly. The second step is to install the Key Connection for SQL Server application on the virtual machine running SQL Server in Windows. This is a normal install process with an MSI file. You answer some questions, install a certificate and private key in the Windows Certificate Store, and run a handful of commands to start SQL Server TDE encryption or Cell Level Encryption. You also restart the log file to be sure that it is encrypted as well. That’s about it. Of course, you will want to follow the instructions on how to set up a high availability key server, and point your Key Connection for SQL Server configuration to it as failover. That is a normal configuration process and also very easy to do. We find that VMware customers can deploy SQL Server encryption very quickly. Data protection is only as secure as you make it! 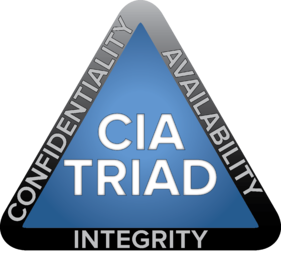 Confidentiality has to do with encrypting data in applications and databases, protecting it from people who should not be seeing that data or accessing it, whether that's in your IT data center or in a cloud environment or in virtualized applications. You have integrity of the encryption key management process itself with connections to the key management HSM to authenticate and retrieve keys or perform on-device encryption operations. Integrity is accomplished through public ­key infrastructure (PKI) mechanisms. Availability is a crucial component especially with encryption key management systems which are mission ­critical applications. You need redundancy both at the hardware and software level with proper application mirroring and database mirroring in place. You should ensure back­ups take place at an appropriate interval and that recovery operations are also tested on a regular basis. These components are achieved with a solid key management solution and the proper managing of the actual encryption keys. The Key Management administrator is responsible for performing a number of functions that must be done, and done properly to meet compliance regulations. The administrator must also follow industry best practices in order to accomplish true encryption key management for their organization and the data they need to protect. One of the first functions the Key Management administrator performs is the actual creation and management of the encryption keys through a key lifecycle. 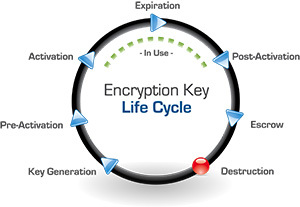 The keys are generated and stored in a secure fashion and then go through the full cycle depicted here to become active, go into use, expire, retire (post-activation), and then be backed up in escrow, and then deleted (the “destruction” phase). This lifecycle is defined by the National Institute of Standards and Technology (NIST) and also requires that a crypto period be defined for each key. A crypto period is the length of time that a key should be used and is determined by a number of factors based on how much data is being protected and how sensitive that data is. While NIST has defined and provided some parameters on how to establish crypto periods (see special publications 800-57 - there are 3 parts) and provided guidance on best practices. Each Key Management administrator needs to determine how long a particular encryption key should be actively used before it is rotated or retired. Auditing and active monitoring of critical key management systems is a fundamental security concept for protecting critical assets like data in a key management solution. The Key Management administrator also needs to implement access controls to be sure that only the users and applications who should be accessing encryption keys are actually doing so. A general practice of separating encrypting keys across different departments or applications should be in place. For example, you may need to protect employee data in your HR system using an encryption key, but you wouldn’t want to use that same encryption key to protect sales data or where you might have credit cards. You need to segment the usage of encryption keys to particular data so that employees in HR are accessing HR data using one key and salespeople can access sales data using a different key. For more information, security expert Patrick Townsend goes into greater depth in his latest podcast: Guidelines for Effective Encryption Key Management. He covers how implementing procedural mechanisms like dual control and separation of duties will help ensure your organization is implementing best security practices. Patrick also outlines fundamental components of a strong defense-in-depth approach to data security and how encryption and key management can protect your enterprise. I encourage you to download the 20 minute podcast! The good news is that encryption key management and data security have come a long way within the past few years. Organizations no longer have to continue to maintain current patchwork methods, because now there are affordable, available, and interoperable solutions that can easily solve their problems. Encryption and encryption key management are now industry standard and work across both legacy and newer business systems, multi-platform and multi-tenant networks, remote access workstations, geographical offices, data centers and third party business partners. Now your risk management approach can go beyond compliance considerations and really focus on protection of your customers personal data and also your business information (and reputation). Encryption and key management can now be a main security control for your organization, rather than a compensating control that is performed only in cases where other controls fail. We have to always remember data gets out, and instead of using encryption as a last resort in a defense and depth strategy, it needs to be the fundamental consideration towards protecting your most important resources. Along with that approach is what we believe is the most important consideration and a basic tenant in a strong encryption key management program: securely separate the data being encrypted from the keys performing that data encryption. Even if someone gets unauthorized access to your data, they can’t read it when it is encrypted. An encryption key manager enables a secure channel between the encryption keys and wherever that data may reside. Technology has evolved to enable stronger management so that companies will no longer be leaving their encryption keys under the front door mat, so to speak. Principles of effective key management include being able to streamline and securely manage encryption keys across different systems and multiple locations, including virtual machines or applications in the cloud. There has to be the ability, first and foremost, to readily manage the encryption keys through the entire key lifecycle. It is essential for an encryption key manager to enable dual control and separation of duties to effectively create, activate, delete, expire, retire and perform additional key controls including key escrow. Separating encryption keys from encrypted data, whether to an internal or external business partner or cloud based services is so important and often overlooked as a high risk to the organization. Despite really good controls and really talented security personnel, there are still people with hostile intent who will design malicious code to go out there and capture and replay credentials. That’s why managing encryption keys separate from the systems where the data resides is so critical, and why managing your encryption keys to third parties and cloud environments is now a recognized industry standard practice with very real benefits. An implementation with known costs - meaning no endpoint licensing fees or additional professional service fees. We proud to be leading the industry in encryption key best practices and we want to make data security affordable and straightforward for every-size company to encrypt their most important data. No one knows the challenges of connecting and protecting business applications and architecture better than Townsend Security. Our mission is to make industry leading key management affordable and deployable to everybody. Our goal is to enable strong, affordable, easy to deploy encryption key management, no matter your industry or company size. We are tried, tested, and trusted technology based on proven, reliable standards that’s also highly affordable, FIPS 140-2 compliant, top-rated in customer support and deployable in physical, hosted, and virtual environments with no hidden costs, no end point licensing fees with flexible pricing options available that can be either a perpetual or monthly subscription.